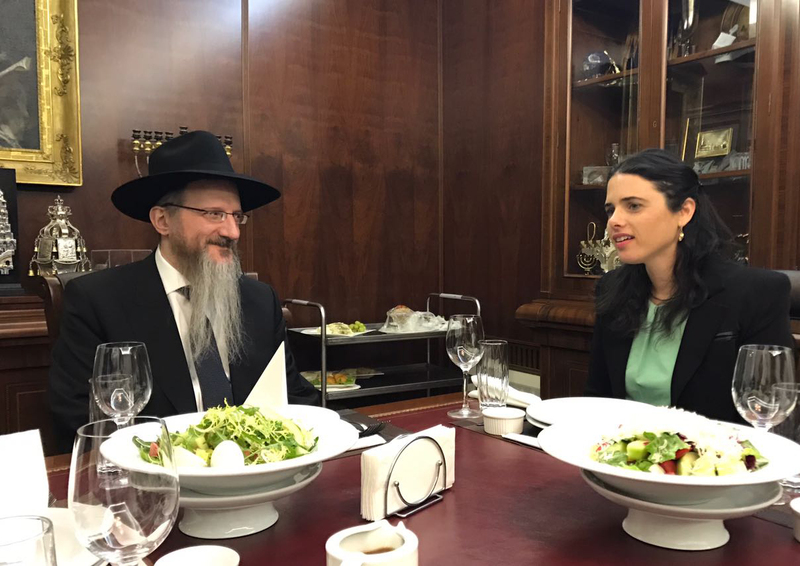 The Justice Minister of Israel, Ms. Ayelet Shaked visited Moscow on Friday, where she met with FJC leaders and chief rabbi of Russia Berel Lazar. The meeting was also attended by the Israeli ambassador to Moscow Mr. Gary Koren, the president of FJC Russia Mr. Alexander Boroda and the CEO of the Federation of Jewish Communities, Mr. David Mondshine. A large part of the meeting was devoted to the discussion of the development of FJC’s youth projects in Russia and cooperation possibilities between Israel and the Russian Jewish diaspora in these projects. “Today’s youth are those who will represent and lead the community tomorrow, and only by having a strong tie to the traditions and culture of the Jewish nation will they succeed in keeping it strong,’ said Rabbi Lazar. “Active participation in community life has a positive effect on their interest in Israel and its current events. In this respect we are doing everything possible to develop and educate that interest. There are annual youth trips to Israel, Europe and the USA, in which over a thousand students participate, where they get to meet with the countries’ political leaders and heads of regions, learn about the history of local Jewish communities and see Jewish life there with their own eyes. One of such trips is planned in the beginning of next month,” Rabbi Lazar added, referring to FJC’s EuroStars program trip, which will begin next week. Another important component in youth education is the annual trip to Poland, where Jewish youth participates in the March of the Living, Rabbi Lazar said. Ms. Shaked thanked the FJC leaders for their important work in reviving Jewish community life in the former Soviet Union. The meeting took place in Moscow’s Jewish community center, where Ms. Shaked also had a chance to learn about the variety of local community projects and programs offered to the public.